This week Erin gave us the star treatment for the Zendala challenge. I get excited to see what Erin has come up with each week and then I am surprised at what my mind's eye sees in the design. In my first challenge I saw surfboards and in this challenge, I saw a sheriff's badge and gun. I fought that idea at first though. Guns and law enforcement are not exactly zen. Know what I mean? So, fighting the idea of guns, I went first to flowers. I started in the center here and added Arc Flower to the circle. I put Knightsbridge in the center to give it a little more interest. Next I did the points of the stars. I was tempted with other patterns but I wanted to play with stripes. I divided the point to give the stripes a little more interest. I repeated Knightsbridge in the smaller circles for several reasons. 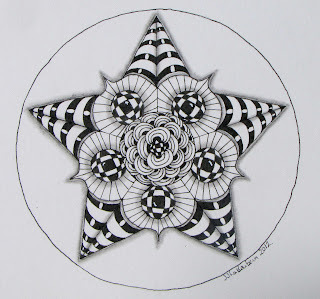 One, I wanted to repeat to tie it in with Arc Flower and the other was to bump up the graphic-ness of the zendala. That left me with the beautiful scalloped section to work with. I was stuck here as I wasn't sure what to use. In the end, I kept it simple. I divided it into sections and drew lines. To my great surprise, the lines seemed to set the Knightsbridge circles off so I shaded them to further pop them up off the page. I haven't gotten any of the round Zendala tiles yet. I'm putting them on my wish list though. Maybe for my birthday this fall someone will surprise me. I liked the idea of the circle so I just traced everything onto a piece of watercolor paper. 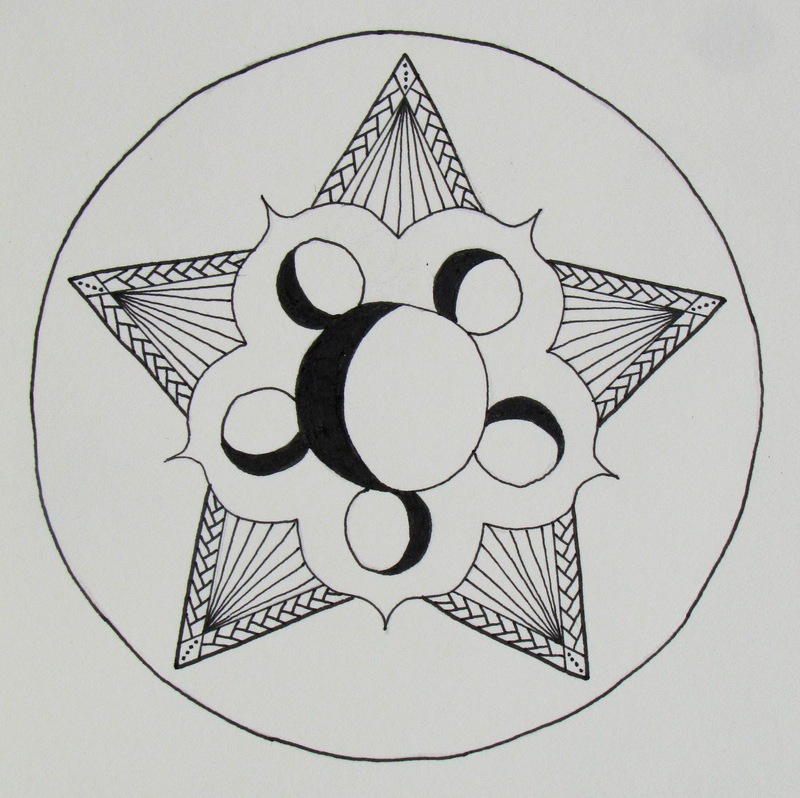 The whole time I was working on the Zendala above though, I could not get the badge and gun image from my mind. So, I decided to just do one anyway. I traced out the design on some drawing paper and went to work. I looked at images of sheriff's badges on line to give me some ideas of what they look like. Braided edges were often repeated so I used those. I added a few lines to reinforce the star. Then it was time for my gun. I found out that the chamber of a gun is not usually decorated. Not on the side that would be visible on this angle anyway. I tried to make the circles look as if we were looking through the chamber of an unloaded pistol. I haven't done any shading yet. I may go back and add some. The weather was so nice today that I went ahead and photographed this. Thanks so much to Erin for creating these templates each week. I don't know how you do them, but I am so very glad that you do. love your zendalas, they are so different from each other but both have a lot of appeal. The see through effect in the second one is very clever. How do some people manage to come up with two ideas for the same template? Two marvelous original designs here. Your choice of tangles in the first one complement each other beautifully. They're both so interesting and so different! I love the bold contrast in the first and the openness of the second. I love the depth of the first one. It is really stunning. Grat Zendalas. I enjoyed reading about your thought process as you were making these. Great Zendalas. I love the first one being so graphic and bold. I enjoy using Nightsbridge and you used it really well here in both parts to complement each other. I like them both, but the first one is really stunning....love it! 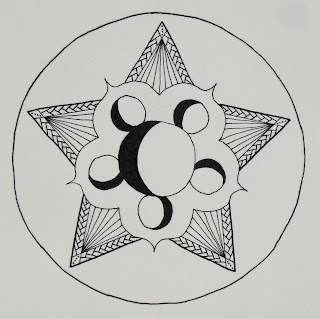 The shading on the first Zendala just "makes it", especially the little white highlights. Terrific example of shading. I'm looking forward to seeing the 'badge' when it's shaded and done. Thank you for sharing both. Both are wonderful and so creative! I love them both; and I can see a badge on the second one; but it isn't un-zen to me. I got a kick out of reading your thought processes and how hard you fought your first impression. Glad you gave in. It's a lovely zendala. Shining flowery gorgeous....the first! Second so fun! i see what you mean about the sheriff's star and barrel. awesome! i was law enforcement for 27 years, retired now for 13 years, guns are a way of life here in our household! i like that tile! I particularly love the first one -- it reminds me of a platter of cookies on a stand. Yum!